In the past 10 years the American Medical Association (AMA) studies have shown that magnets are a great source of relief for joints, muscles, headaches, and pain associated with Carpal Tunnel, Arthritis, and FibroMyalgia. Symptoms include stiffness of the shoulder, back, neck, uncertain lower back pain, and chest pains for no specific reason, habitual headaches, dizziness, and general fatigue, various inflammatory and degenerative joint diseases such as arthritis. arthrosis, gonarthrosis, coxarthrosis. Many books and articles have been published regarding the curative effects of using magnets as a tool to wellness. The recommended magnet therapy is derived from several books and articles and is for your reading enjoyment and does not in any way replace the need to consult a healthcare professional if you need medical attention. Using magnets is a complementary therapy and should not be used by those wearing a battery-operated device or for those who are pregnant. In 1976 Doctor Nakagawa, a Japanese rheumatologist, published his results of the work he had carried out on 11,648 magnet users. He found that 91% of people felt that the magnets were useful in countering their arthritic, lumbago, rheumatic, neuralgia, and muscular pain. Over 140 million people are using magnets for pain relief! Magnetic therapy dates as far back as the ancient Egyptians. Magnets have long been believed to have healing powers associated with muscle pain and stiffness. Chinese healers as early as 200 B.C. were said to use magnetic lodestones or*magnetite* on the body to correct unhealthy imbalances in the flow of qi, or energy. Magnetic therapy is becoming more and more widely accepted as an alternative method of pain relief. Since the late 1950s, hundreds of studies have demonstrated the effectiveness of magnetic therapy being an effective, non-invasive, drug-free way to help reduce pain, to help increase flexibility and promote the body’s own natural healing process. Almost 20 years have elapsed since we (Nakagawa, K., et al.) began research on “Magnetism and Living Bodies”. Judging from the results of our research and those of other groups during this period, as well as from extensive referential data available both in Japan and abroad, I have come to the belief that we assume the presence of what we call “The Magnetic Field Deficiency Syndrome” in human bodies. Hereinafter ‘Magnetism’ or ‘Magnetic field’ will imply a stationary state. Considering: 1. Facts gained from clinical studies, 2. The decreasing strength of the Earth’s magnetic field and 3. The relationship between the human body and magnetism, I am of the following belief. The human body is under the influence of the Earth’s magnetic field and is keeping some sort of balance relationship with it. However, under modern day living conditions, the effect of this field has decreased. Consequently, we can assume that for a certain human body, this lack of magnetism has caused some abnormalities. For this reason, by the external application of a magnetic field to the human body to supplement this deficiency, such abnormal conditions can be improved. In other words, I feel that there is a direct relationship between the decrease in the earth’s magnetic field acting on the human body and the improvement of abnormal conditions of the human body by the application of magnetic fields. The symptoms of the syndrome are; “Stiffness” of the shoulders, back and scruff of the neck, uncertain lumbago, chest pains for no specific reason, habitual headache and heaviness of the head, dizziness and insomnia for uncertain reasons, habitual constipation, general lassitude, various inflammatory and degenerative joint diseases such as arthritis. arthrosis, gonarthrosis, coxarthrosis, etc. In 1878, Charot and Renard(27) wrote of the effects of magnetism on hysteria and in 1879 Mueller(27) wrote that itchiness and pain were noticed when a magnetic field was applied to the human body. Westphal(27) and Gangee(27) reported in 1878 of abnormal skin feeling returning to normal on the application of magnetism. In the same year, Waldmann(28) announced his thesis on “Der Magnetismus in der Heilkunde”. This was probably the first thesis concerning the application of a magnetic field to the treatment of illnesses. In 1879, Benedict (27) and Drosdov (27) reported that the application of a magnetic field reduced pain stemming from various causes. A thesis forwarded by Benedict, M. (29) in 1885 used the word Magneto-therapie, and in 1886 Quinan, J.R. (24)(30) announced a general history of the application of magnetism in medical science. Following this, during the 1920′s, as far as I can ascertain only a few theses on magneto-therapy were forwarded. However, in 1928, Rosenberg(27) stated that “We must admit that until now no basis for acknowledging the effect of a constant magnetic field has been obtained.” This appeared to become the established theory in western countries, and also appears to have been accepted in Japan. I believe it was because of this that research on magnetism in the medical and biological fields was deemed meaningless. During the 1950′s, research on the removal of strongly magnetic objects from the human body was made (35)(36), but as this also does not fall into the category of magneto-therapy I will not elaborate. In 1960, Freeman, M.W. (37) forwarded his thesis on “Magnetism in Medicine”, however this also does not deal with the therapeutic effects of magnetism. Sinkarera, L.F. et al. (38) reported in 1970 that a constant magnetic field was found effective in treating inflammatory illnesses of the female genital organs. In 1972, Degan, I.L. (39) experimented with applying a constant magnetic field of 450-530 gauss to the hands of patients suffering from Dupuytren’s contracture incurable by drugs. the treatment lasted for 15-40 minutes at a time, this being repeated from 5-40 times depending on the case. The treatment was found effective on first-degree symptoms, and also considerable improvement was noticed as well in cases with second degree symptoms. The earth’s magnetic field is of course a stationary magnetic field working constantly on the human body. For this reason, I wish to discuss here whether this field is actually in a deficient state or not. Kawai(40) stated that the strength of the earth’s field has decreased a total of 50% during the last 500 years, decreasing 5% over the past 100 years. Furthermore, it is said(41) that the total moment of the earth’s magnetic field has been decreasing at the rate of 0.05% per year. Along these lines, Rikitake(42) also states that the magnetic moment of the earth is decreasing quite rapidly, the rate of decrease having reached about 5% per one hundred years. He maintains that if this continues the earth’s magnetic field will eventually reach zero in 200 years. Along with this decrease, the angles of the earth’s magnetic field are also said to be changing. It seems certain we can assume that the earth’s magnetic field is decreasing in strength, and we can well imagine that this could be the cause of disorder in the human body. Furthermore, we also consider that there are other factors as well, which could play a part in decreasing the effect of the earth’s field acting on the human body. Living or working in steel frame or steel structure buildings is one of these. Iron is several hundred to several thousand times more permeable than air(43), and so can absorb a large part of the magnetic lines of the earth’s field thus sheltering people from such. Automobiles, electric trains, and ships are, to some extent, also sheltered places, the latter being especially so. As the human race has long been under the influence of the earth’s magnetic field I believe, as I mentioned before(7), that any change in this field could cause disorder in the human body. Kawai’s book (40) is subtitled “The Earth’s Magnetic Field Controls the Weather”, and if this is really the situation, the human body will be influenced by this change in the weather. This can be shown as follows: Change in the earth’s magnetic field leads to a change in the weather which leads to an influence on the human body and consequent disorder of some kind. We are left with the question of how magnetic fields (including the earth’s field) directly affect the human body, and I wish to take this up in the next article. There is a difference between each human body, and one such case could be suffering from a magnetic field deficiency even if there was no decrease in the strength of the earth’s field. However, the people with the stated above show improvement when a magnetic field is applied, and we believe that at least with these people, there is a magnetic field deficiency. 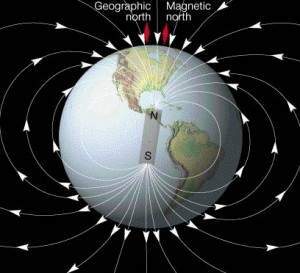 To summarize, the earth’s magnetic field acting on the human body has, for various reasons, been decreasing and this is believed to cause some sort of disorder in the human body. Therefore, when by some method a magnetic field is applied to the human body it is clear that the symptoms can be improved (see referential literature quoted), and this is the basis for our advocating the presence of the magnetic field deficiency syndrome. Research on magnetic fields and the living body has become very active in recent years, much literature having been published. In this article I wish, through items other than those concerning the treatment effects of magnetic fields to discuss the relationship between magnetic fields and the human body. What I will take up here is concerned with the functional order of a magnetic field on the human body. It is clear that an electric change will occur when a magnetic field is applied to the human body, but this is not an insertion of electrical energy into the it is only a conversion of a part of the motion energy of the body fluid into electrical energy through the medium of a magnetic field. Therefore, we cannot consider it as an insertion of energy as the energy of the magnetic field is much smaller than other physical phenomena used for therapy today. If this is the case, we must consider the mal-effects on the human body as the result of the application of such a field. Therefore, for even a small change in the earth’s field that of the human body will be much affected. This may even affect the active current within the human body. Therefore, for even a small change in the earth’s field that of the human body will be much affected. This may even affect the active current within the human body, and we can imagine that this could be the cause of disorder or change in the body. As the earth’s magnetic field is to some extent always working on the body, and as the body fluid is always in motion even when the body is at rest, it must be that electromotive force is constantly being generated by electromagnetic induction. Also, when a man is in motion, he moves across the magnetic field and in the same way as a conductive material moving across a magnetic field it is also possible to consider that electromotive force could be generated. In Japan, magnetotherapeutic devices are registered under the Drug Regulations Act of 1961 as No. 81 on the list covering Devices and Machines. This implementing of regulations to control the manufacture and sale of magnetotherapeutic devices happened three (1) years after we first reported on such devices to a medical congress, two years after the symposium on magnetism and the living body(6)(8) was held, and two years after we proposed the establishment of such regulations to the Minister of health and Welfare (according to my diary). Since that date, it has become illegal to manufacture and sell magnetotherapeutic devices have been officially approved. 1) They can be easily used. 2) They can be used for long hours continuously. 3) The user can adjust the hours of usage to the subjective symptoms. 4) No serious side-effects can be found. Regarding side-effects, we could not detect anything serious but did have occasional reports of people feeling a ‘rush of blood to the head’ or a ‘dull-headed’ feeling. In our study (60), we had 4 out of 166 report such feelings. However, even with these people the stiffness in the shoulders was improved and I suggest that in such cases people accustom their bodies to the necklace by repeated intermittent usage of it. We are also informed that people working within strong magnetic fields are in good health, and we plan to look into this point in the future. The human race, having been living on this earth, has been influenced by at least two physical phenomena- gravity and the earth’s magnetic field. The relationship between gravity and the human body and, in relationship to recent space travel, the influence of a no-gravity condition on the human body has been the objects of research. On the contrary, however, this is hardly true when it comes to the study of the earth’s magnetic field on the human body. In the field of biology and field science, there has been some research done on the influence on test animals shielded from magnetic fields(58)(62), and during 1935-1976 research on the effects on the human body of being exposed to a very weak magnetic field for a ten day, one month and five year period of time was conducted(63). However, no reliable uniform information was forthcoming, and the relationship between the earth’s magnetic field and the living body is still unclarified.